:Highly respected New Testament scholar Craig Keener is known for his meticulous and comprehensive research. This commentary on Acts, his magnum opus, may be the largest and most thoroughly documented Acts commentary ever written. Useful not only for the study of Acts but also early Christianity, this work sets Acts in its first-century context. 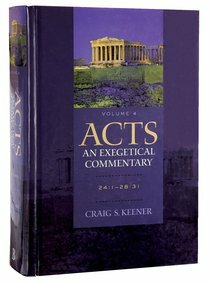 About "Acts 24: 1-28 31 (Volume 4) (#04 in Acts An Exegetical Commentary Series)"
This item is a special order. Payment is by credit card only. Orders for this item cannot be cancelled or returned. Other edition is available. 9780801048371 0 Available. Craig Keener's detailed socio-historical exegesis of Acts draws on an unparalleled range of ancient sources and interacts judiciously with current scholarship. This magisterial commentary is essential reading for students of Acts, written by a scholar who takes its historicity seriously. 4,560 pages total, from Baker. In this volume, the third of four, Keener continues his meticulous exegesis of Acts (15:1 - 23:35) from a socio-historical perspective. He utilizes a wide range of ancient sources and interacts judiciously with current scholarship, while taking the historicity of Acts seriously. A magisterial work!